This is a fantastic company. Glenn's work was brilliant - he went beyond the call of duty for us - and he was always professional. His work has made a HUGE difference to our house! Can't recommend him enough. Glenn's work is exceptional and has, without doubt, increased the value of our house. He is professional, absolutely reliable and frequently goes above and beyond the call of duty to ensure we are happy with the service he's providing. Cannot recommend enough. GMT Pointing Specialists were recently asked to carry out some localised areas of maintenance / repair pointing on a grade II listed building on behalf of the trustees for the 4th Duke of Westminster on the Grosvenor Eaton Estate Cheshire. The re-pointing was done with due diligence and professionalism and in a timely manner to a high standard. The contractor also displayed not only good working practices for this type of work, but also gave sound advice on areas for further works and a solid understanding of how work on a listed building can and cannot not be done. Including the use of the correct materials that must be used. (related to pointing). They also demonstrated that they were very health and safety conscious throughout the contract period and left the site clean and tidy. 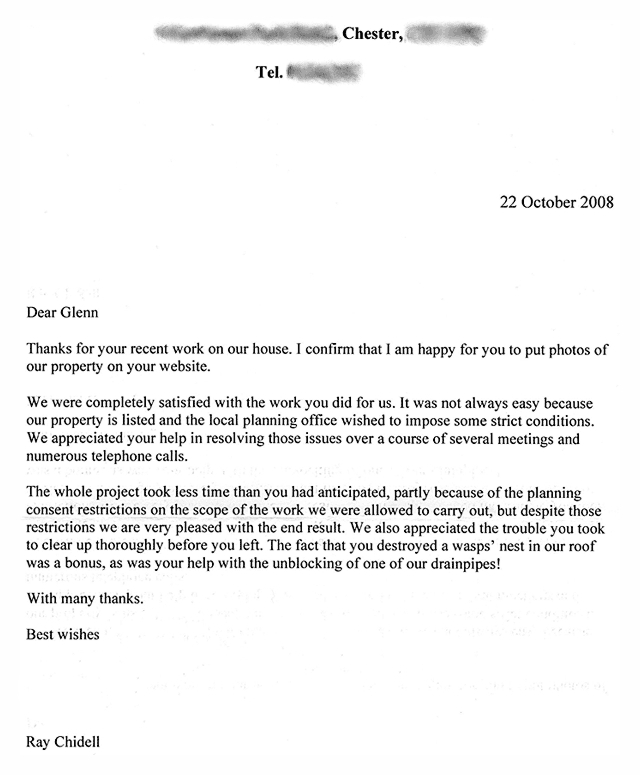 We would have no hesitation in using their services again in the future. Glenn is extremely knowledgeable in his field. His professionalism and in depth knowledge of repointing is second to none. He carried out a repointing job on a large chimney and end gable on our Port Sunlight house. Glenn liaised with the Port Sunlight trust and checked specification for us to ensure the work was performed within the grade 2 listed buildings consent. The work was very neat and his colour matching of the new mortar was excellent. Everything was cleaned and tidied after the work was complete. When looking for a company to re-point my house I initially employed a company that turned out to be a right bunch of cowboys. The work was shoddy, untidy, not fit for purpose and they left blocked drains, stained paving, damaged garden furniture ( they used some metal garden chars in lieu of ladders). During the grinding out process they had made no effort to contain the debris. The house looked a mess! 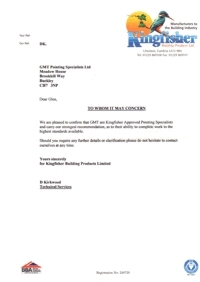 After looking around for reputable companies I came across GMT Pointing Specialists Ltd. I spoke to Glenn on the phone, arranged a time for him to have a look and get a quote. After inspection and agreeing a price Glenn suggested a timetable and kept me informed of what would happen when. Glenn arrived on the agreed day, at the agreed time and set to work. Pointing is a messy business, both prep ( grinding out) and the actual pointing as well. But during the whole job any mess was kept to a minimum, to reduce the dust created by grinding Glenn worked behind a sheet to keep it contained. At the end of every day the site was cleaned and looked presentable - all my neighbours commented on how tidy Glenn worked. After the grinding out and cleaning the walls, Glenn started to put things back together, starting with a small area for me to approve the colour of the mortar. Once approved he repointed the walls, further raking out little bits of old mortar that were missed during the grinding process. When Glenn finished the work he also went out of his way to clean the mortar stains left by the previous company off the paving, and he gave the fence brick plinth a quick going over to help match it colourwise to the house. The drains were left clean and in perfect working order. I would have absolutely no hesitation in recommending Glenn to anyone. Many thanks for the great job you carried out repointing our house, which was previously blighted by some pretty horrible patch pointing, which invariably involved completely the wrong type of mortar for the age of the property (circa 1750s). You were the only one to take the time to talk through what the options were, what the best course of action would be (given the age of my house) and, critically, why. No other pointer bothered to go to this level of detail and frankly some of them looked at me blankly when I broached the subject of what mortar to use. This gave me a great deal of confidence in you, which was essential for the size of the project and I am delighted with the job youâ€™ve done. It is fair to say that you have transformed the look of our home and with the other improvements weâ€™ve made (windows, porch etc) it is feeling like a new house! Feel free to use the before and after photos you took and if anybody needs a chat to reassure them in any way Iâ€™d be only too happy to oblige. Feel free to pop by anytime, even if its just to admire your work! We instructed GMT pointing to undertake the replacement and repair of the wrong mortar originally used on our 300 year old Grade II listed barn conversion and would not hesitate to recommend GMT Pointing. This was a complicated and challenging project that required a lengthy planning approval process from the local planning authority, for which GMT assisted in detailing how the work would be undertaken and the materials to be used etc in the process of removing the various mix of mortar used and replacing with a lime mortar to safeguard the handmade bricks from further deterioration. 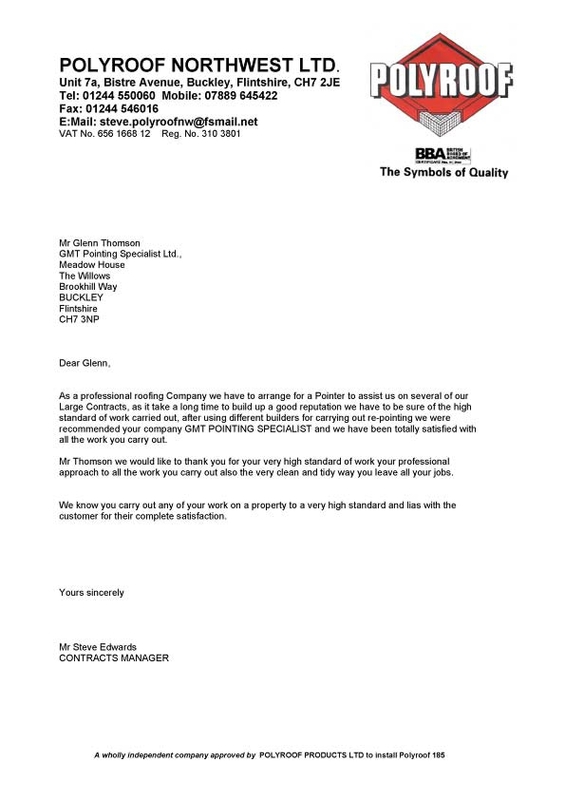 As well as producing a very high quality standard of work, Glenn went out of his way to make the process as painless as possible for ourselves and our neighbours. 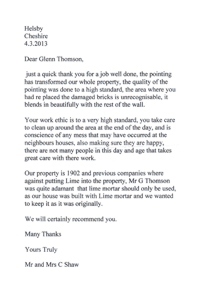 Glenn was extremely respectful to the surroundings and undertook additional work on our neighbour's property as they were all impressed by his conduct and high level of experience, knowledge and craftsmanship. Glenn also ensured that all outside areas were as tidy as possible to limit the amount of disruption caused to ourselves and neighbours. 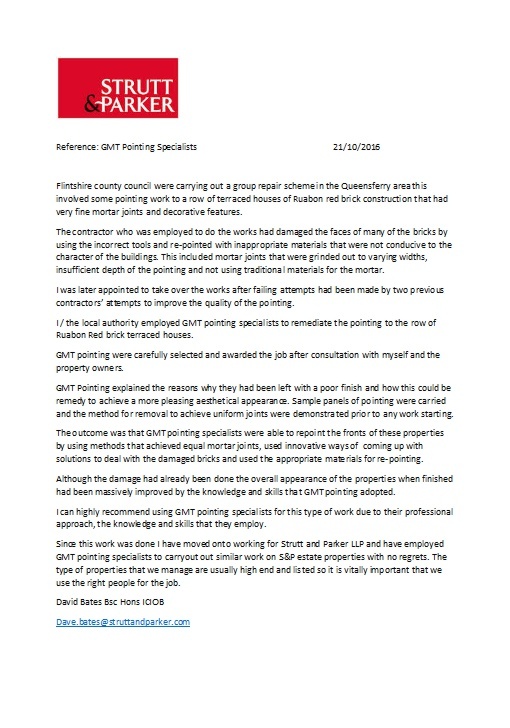 Flintshire county council were carrying out a group repair scheme in the Queensferry area this involved some pointing work to a row of terraced houses of Ruabon red brick construction that had very fine mortar joints and decorative features. The contractor who was employed to do the works had damaged the faces of many of the bricks by using the incorrect tools and re-pointed with inappropriate materials that were not conducive to the character of the buildings. This included mortar joints that were grinded out to varying widths, insufficient depth of the pointing and not using traditional materials for the mortar. I was later appointed to take over the works after failing attempts had been made by two previous contractors' attempts to improve the quality of the pointing. I / the local authority employed GMT pointing specialists to remediate the pointing to the row of Ruabon Red brick terraced houses. 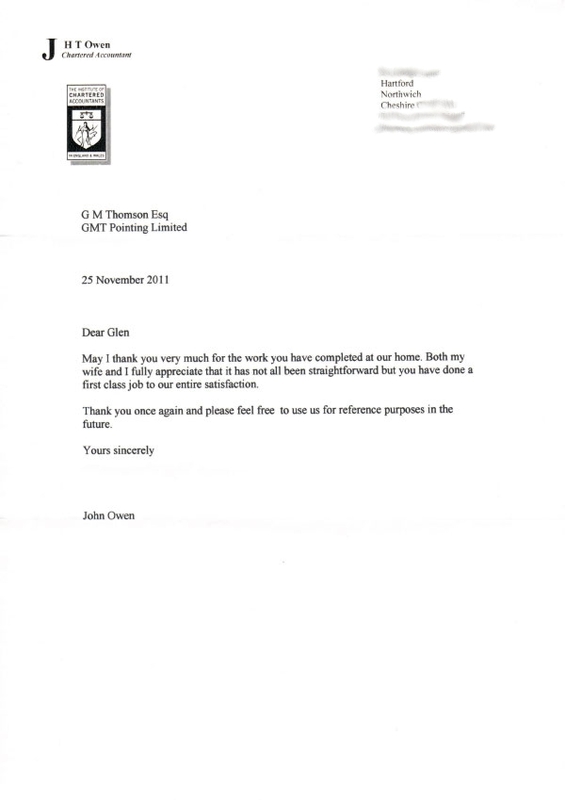 GMT pointing were carefully selected and awarded the job after consultation with myself and the property owners. 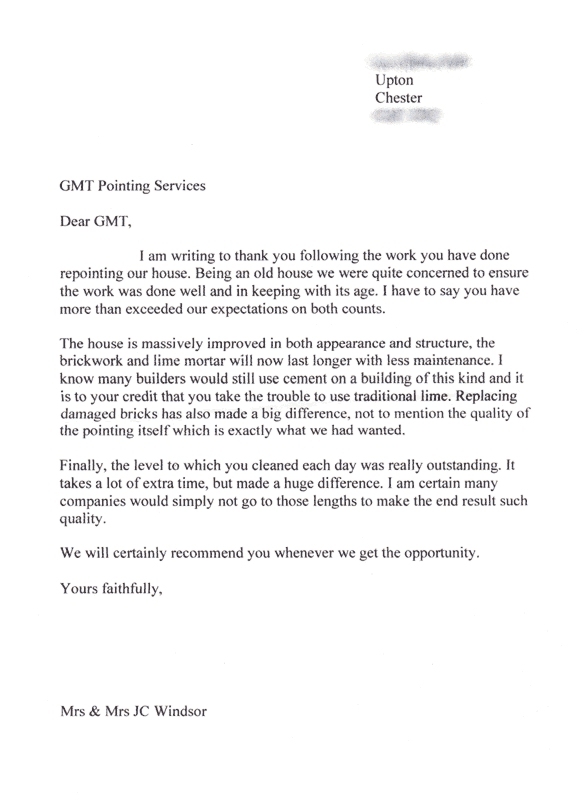 GMT Pointing explained the reasons why they had been left with a poor finish and how this could be remedy to achieve a more pleasing aesthetical appearance. Sample panels of pointing were carried and the method for removal to achieve uniform joints were demonstrated prior to any work starting. 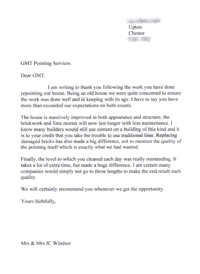 The outcome was that GMT pointing specialists were able to repoint the fronts of these properties by using methods that achieved equal mortar joints, used innovative ways of coming up with solutions to deal with the damaged bricks and used the appropriate materials for re-pointing. Although the damage had already been done the overall appearance of the properties when finished had been massively improved by the knowledge and skills that GMT pointing adopted. I can highly recommend using GMT pointing specialists for this type of work due to their professional approach, the knowledge and skills that they employ. 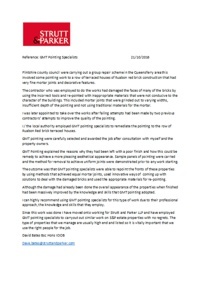 Since this work was done I have moved onto working for Strutt and Parker LLP and have employed GMT pointing specialists to carryout out similar work on S&P estate properties with no regrets. The type of properties that we manage are usually high end and listed so it is vitally important that we use the right people for the job. 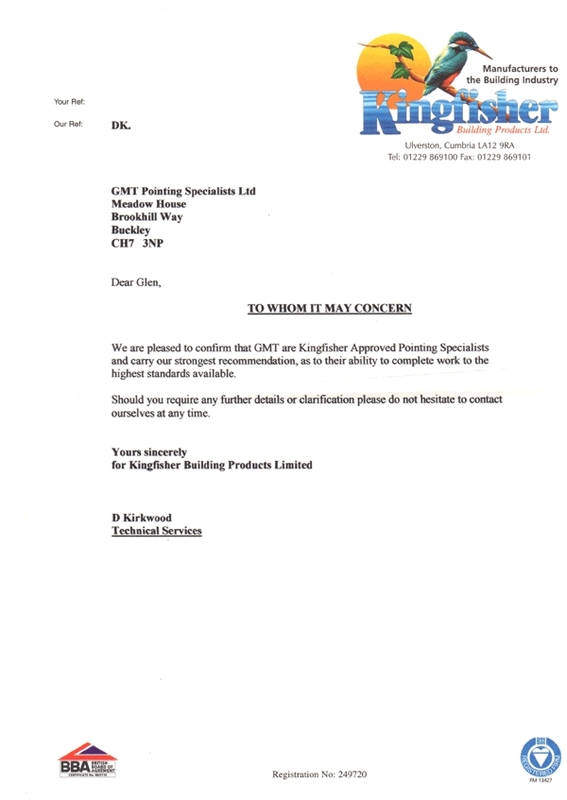 We are pleased to confirm that GMT are Kingfisher Approved Pointing Specialists, and carry our strongest recommendation, as to their ablility to complete work to the highest standards available. Should you require any further details or clarification please do not hesitate to contact ourselves at any time." Just a quick thank you for a job well done, the pointing has transformed our whole property, the quality of the pointing was done to a high standard, the area where you had re placed the damaged bricks is unrecognisable, it blends in beautifully with the rest of the wall. Your work ethic is to a very high standard, you take care to clean up around the area at the end of the day, and is conscience of any mess that may have occurred at the neighbours houses, also making sure they are happy, there are not many people in this day and age that takes great care with there work. 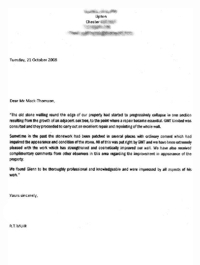 Our property is 1902 and previous companies where against putting Lime into the property, Mr G Thomson was quite adamant that lime mortar should only be used, as our house was built with Lime mortar and we wanted to keep it as it was originally." 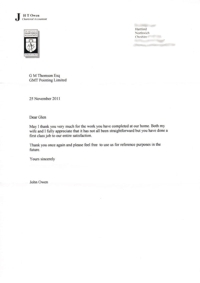 I am writing to thank you following the work you have done repointing our house. Being an old house we were quite concerned to ensure the work was done well and in keeping with its age. I have to say you have more than exceeded our expectations on both counts. The house is massively improved in both appearance and structure, the brickwork and lime mortar will now last longer with less maintenance. I know many builders would still use cement on a building of this kind and it is to your credit that you take the trouble to use traditional lime. Replacing damaged bricks has also made a big difference, not to mention the quality of the pointing itself which is exactly what we wanted. Finally, the level to which you cleaned each day was really outstanding. It takes a lot of extra time, but made a huge difference. I am certain many companies would not go to those lengths to make the end result such quality. We will certainly recommend you whenever we get the opportunity." May I thank you very much for the work you have completed at our home. Both my wife and I fully appreciate that it has not all been straightforward but you have done a first class job to our entire satisfaction. Thank you once again and please feel free to use us for reference purposes in the future." 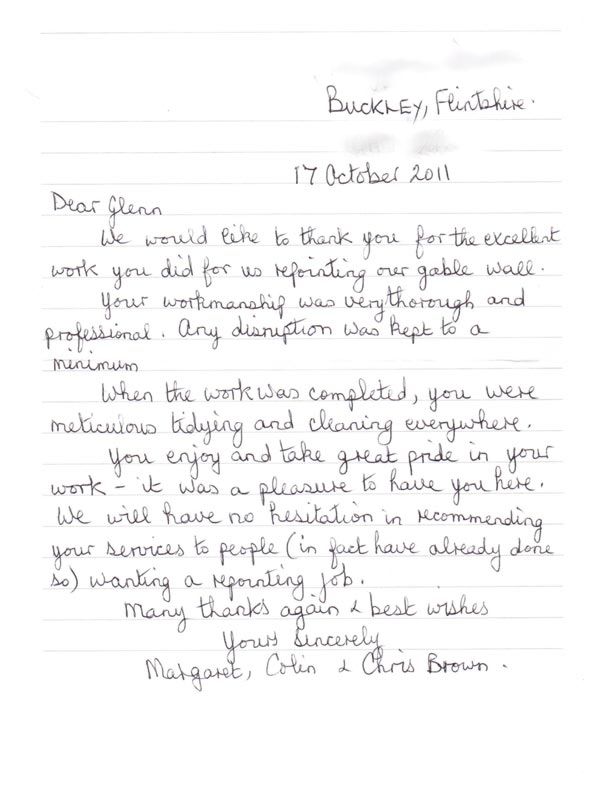 We would like to thank you for the excellent work you did for us re pointing our gable wall. Your workmanship was very thorough and professional. Any disruption was kept to a minimum. When the work was completed, you were meticulous tidying and cleaning everywhere. You enjoy and take great pride in your work, it was a pleasure to have you here. 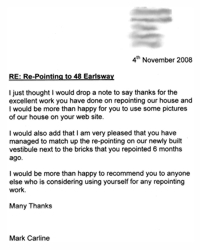 We will have no hesitation in recommending your services to people (in fact we have already done so) wanting a re pointing job." 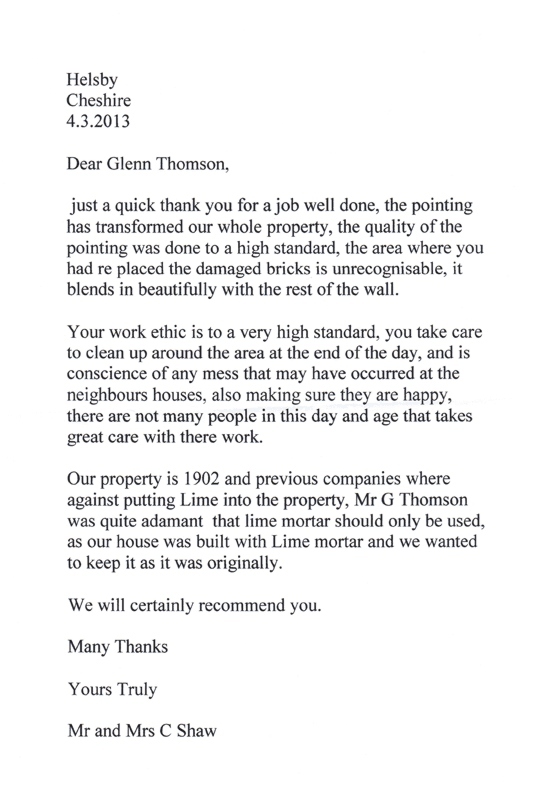 Mr Thomson we would like to thank you for your very high standard of work, your professional approach to all the work you carry out, also the very clean and tidy way you leave all your jobs...."
I just thought I would drop a note to say thanks foor the excellent work you have done on repointing our house and I would be more than happy for you to use some pictures of our house on your web site. 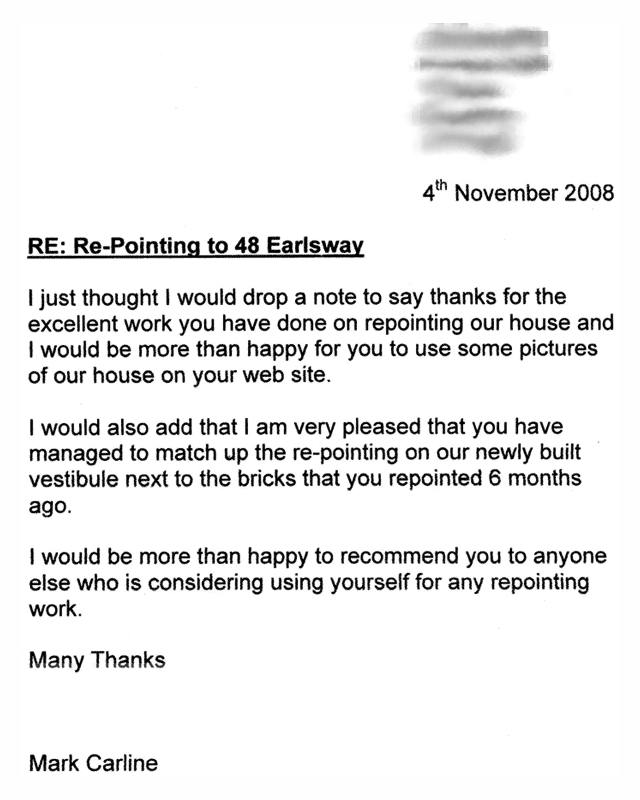 I would also add that I am very pleased that you have managed to match up the re-pointing on our newly built vestibule next to the bricks that you repointed 6 months ago. 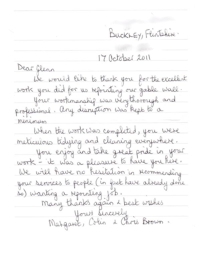 I would be more than happy to recommend you to anyone else who is considering using yourself for any repointing work." I would just like to thank you for the excellent job you made of our pointing on the front of my bungalow. 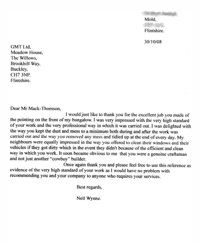 I was very impressed with the very high standard of your work and the very professional way in which it was carried out. I was delighted with the way you kept the dust and mess to a minimum both during and after the work was carried out and the way you removed any mess and tidied up at the end of every day. My neighbours were equally impressed in the way you offered to clean their windows and their vehicles if they got dirty which in the event they didn't because of the efficient and clean way in which you work. It soon became obvious to me that you were a genuine craftsman and not just another "cowboy" builder. 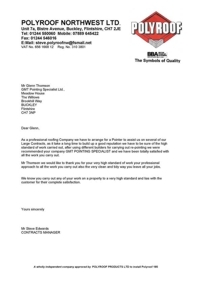 Once again thank you and please feel free to use this reference as evidence of the very high standard of your work as I would have no problem recommending you and your company to anyone who requires your services." Thanks for your recent work on our house. I confirm that I am happy for you to put photos of our property on your website. 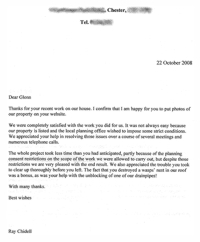 We were completely satisfied with the work you did for us. It was not always easy because our property is listed and the local planning office wished to impose some strict conditions. We appreciated your help in resolving those issues over a course of several meetings and numerous telephone calls. The whole project took less time then you anticipated, partly because of the planning consent restrictions on the scope of the work we were allowed to carry out, but despite those restriction we are very pleased with the end result. We also appreciated the trouble you took to clear up thoroughly before you left. The fact that you destroyed a wasps' nest in our roof was a bonus, as was your help with the unblocking of one of our drainpipes!" The old stone walling round the edge of our property has started to progressively collapse in one section resulting from the growth of an adjacent oak tree, to the point where the repair became essential. 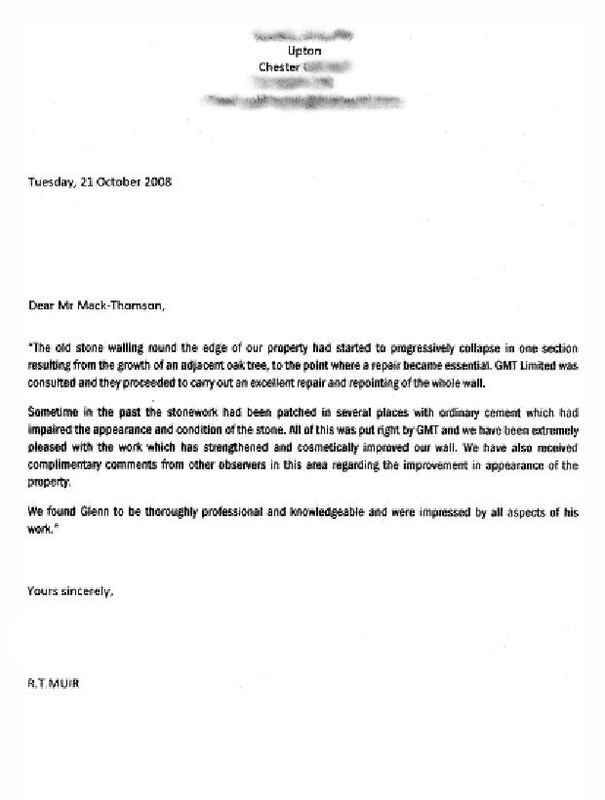 GMT Limited was consulted and they proceeded to carry out an excellent repair and repointing of the whole wall. Sometimes in the past the stonework has been patched in several places with ordinary cement which had impaired the appearance and condition of the stone. All of this was put right by GMT and we have been extremely pleased with the work which has strengthened and cosmetically improved our wall. We have also received complimentary comments from other observers in this area regarding the improvement in appearance in the property. We found Glenn to be thoroughly professional and knowledgable and were impressed by all aspects of his work."